There’s no reason that all robots should be created the same size. Now you can pick up these tiny little battery bots, that although may not do much, they’re still cute. If your desk needs a touch more charm, just pick up a couple of these in the different forms they come in and you won’t be able to help but smile at the sight of them. Although, it might cause you to get distracted from work when you start assembling them into strange formations and flip on whichever function the robot you chose happens to have. These are designed by Wayne Poulton who created both Machine bOb who is shown here, as well as his protector Machine PP3. 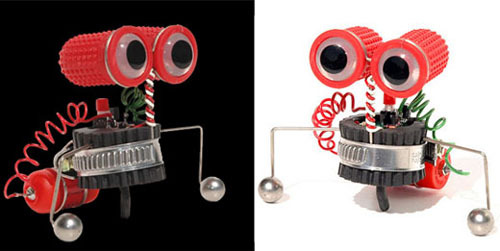 Machine bOb is said to be a skittery little guy, who can wheel his way across your desk. All the while lighting the way with his bright eyes. To keep him out of trouble though you’ll want PP3, which was the first of the designer’s creations. You can pick them both up for the same price on Anti-Gravity. They’re sold for £9.99 each.